Ask The Butcher is the ultimate meat cooking application for professionals and aspiring home master chefs! Impress your friends at your next BBQ with the unique Cooking Timer and mouth-watering exclusive recipes from one of the world’s leading Charcuterie Chefs. Ask The Butcher is the ultimate educational, inspirational and handy meat-cooking application available. A truly practical tool to improve your cooking skills and impress your friends. Ask The Butcher has been developed in partnership with Vic’s Premium Quality Meat – one of the world’s leading Premium Quality Meat Suppliers. 3. Weber’s On the Grill™ By Weber-Stephen Products Co.
SEARCH AND BROWSE over 300 triple-tested, classic recipes from Weber’s best-selling cookbooks, from starters to desserts, including rubs, marinades, and sauces. Recipes are from Weber’s Art of the Grill™, Weber’s Big Book of Grilling™, Weber’s Charcoal Grilling™, and Weber’s Real Grilling™. STORE ingredients from any recipe in an itemized grocery list. To make shopping easy, the ingredients are organized by category to facilitate shopping. You can add as many recipes to the grocery list as you want, and the app will combine all the ingredients you will need at the store. A simple check box lets you mark off items as you shop. SHARE recipes and grocery lists with friends and family via email. REFERENCE 100+ tips for expert grilling. LEARN essential grilling techniques for taking your skills to the next level. WATCH short instructional grilling videos by celebrity chef and cookbook author Jamie Purviance. TAG your favorite recipes and techniques for future reference. 4. HarvestMark Food Traceability By YottaMark, Inc.
You want to know more about the fresh food that you buy, like where it was grown and if it’s safe. Now you can trace your food back to the source using your iPhone wherever you see the HarvestMark logo. 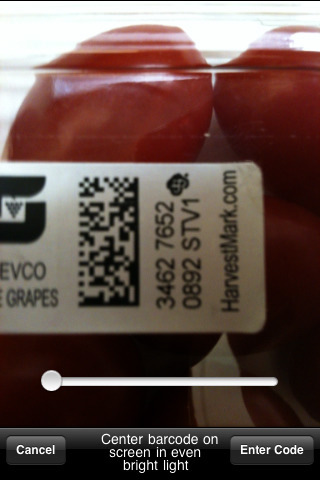 HarvestMark Codes can be found on hundreds of millions of fresh food items and can now be scanned (3Gs only) or typed into your iPhone. With HarvestMark traceability you’ll know who grew your food and whether there are any issues that you should be aware of. That’s the kind of transparency that you deserve for you and your family. Download HarvestMark for your iPhone or iPod Touch now and look for the HarvestMark logo the next time that you’re in the grocery store. You’ll find HarvestMark codes on major brands of berries, grapes, tomatoes, watermelons, cantaloupe, eggplant, peppers, MicroBaker yams … and many more being introduced everyday. Also look for HarvestMark Codes appearing on Kroger’s bagged salads and other fresh produce products. – DISCOVER a quick, easy dinner recipe, delivered daily, along with expert tips from Martha’s team. Our editors choose recipes that are simple to prepare, seasonal, and family friendly. – SEARCH AND DOWNLOAD tried-and-true recipes with powerful search tools. You’ll find thousands of Everyday Food recipes organized by main ingredient, holiday, cooking method, and more. – CREATE as many shopping lists as you like. Each list will be sorted by store and aisle automatically. – ADD all of a recipe’s ingredients to your shopping list with a single click. Or add ingredients individually by name or barcode using our database of thousands of brand-name items. – SHARE recipes and shopping lists with family and friends. Let them help you shop! – ACCESS your favorite recipes and shopping lists on your phone and the web. Changes are synched automatically. – SIMPLIFY your shopping trips by locating grocery stores near you with maps and driving directions, creating store-specific lists, and more. 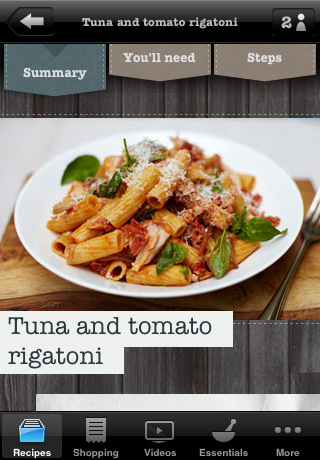 Recipes from the award-winning food site Epicurious.com are now available on your iPhone and your iPad. Search more than 30,000 delicious, professionally created recipes from Bon Appét*t,Gourmet, Self, and renowned chefs and cookbooks. Save your favorite recipes, and sync your Favorites list in the app with your personal online Recipe Box at Epicurious.com. You can also create shopping lists, and e-mail recipes and shopping lists to yourself and friends. Plus, get access to authoritative recipe reviews from Epicurious members. Mixologist is the ultimate drink recipe and bartending guide. 8. Whole Foods Market Recipes By Whole Foods Market, Inc. Looking for healthy and delicious food? Search Whole Foods Market Recipes for recipes featuring the finest natural and organic foods. You can search recipes by ingredients and dietary preferences such as gluten-free, low fat, and vegetarian/vegan. Every Whole Foods Market recipe includes nutritional information and cooking instructions. You can also enter up to 3 items you have on hand to find recipes using those ingredients. Take 170,000+ recipes (including your own) and your grocery list anywhere on your iPhone. With over three million downloads, BigOven is one of the top iPhone food apps. This award-winning app was chosen as one of the “Best Apps for Foodies”, “Best Apps for New Moms” and “Best App for Eating In” by well-known publications. 10. 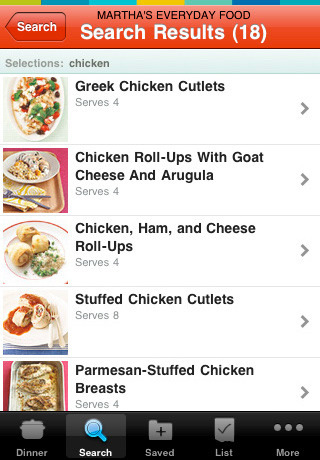 Allrecipes – Your Kitchen Inspiration By All Recipes, Inc.
•Search recipes by course, cooking method, or prep time. •Filter your results by popularity or member rating! A look around the restaurants , exclusive video of roux scholarship , direct table booking facility to all 3 restaurants in London. 40 plus years of knowledge passed down from Albert Roux the godfather of Haute Cuisine in the uk. Great selection of apps! I like the traceability app idea. And AllRecipes is a good site so hopefully the app is equally as good. Another one not mentioned is the Fishmonger app which gives great info on 50 species of fish plus videos of how to butcher them.